PRODUCT RATING Quite soft, but thin and flimsy. For those willing to make a little sacrifice for the good of the environment. GREEN RATING Deep Green. 100% recycled. Non-chlorine bleached. The two key concerns expressed by consumers about buying toilet paper made from recycled paper are that it may not be hygienic and it’s simply not as nice as using virgin pulp. To allay the first concern, you can simply check the official PRC government test results online (unfortunately, it’s in Chinese only). In short, the manufacturer of the Green Soft brand we’re reviewing here (and have been using for the past two years) has passed the government hygiene tests. The second issue is that it is not as nice as conventional toilet paper. In this case, that happens to be true. The first thing you notice when you unpack it is that the roll is held closed by a piece of Scotch tape. Then you’ll notice the color, which is greyish rather than snow white. That’s because it is not bleached with chlorine. Conventional toilet paper is whitened with chlorine bleach, which can release toxins in the air and water when combined with other chemicals. It’s soft to the touch but somewhat thin and flimsy. So it rips easily rather than tearing cleanly on the dotted line. Occasionally, the roll of paper has slipped off the tube which can be quite annoying. So there are quite a number of issues with this product but I think most would agree that they could be overlooked if the product performs well in its main task. So how well does it work? In the unforgettable words of a friend who recently started using Green Soft, “my a_ _ can’t tell the difference”. In 2009, US environmental non-profit organisation the Natural Resources Defence Council (NRDC) estimated that if every household in the United States replaced a single 500-sheet roll of virgin pulp toilet paper with one that used 100 per cent recycled paper, 423,900 trees could be saved. 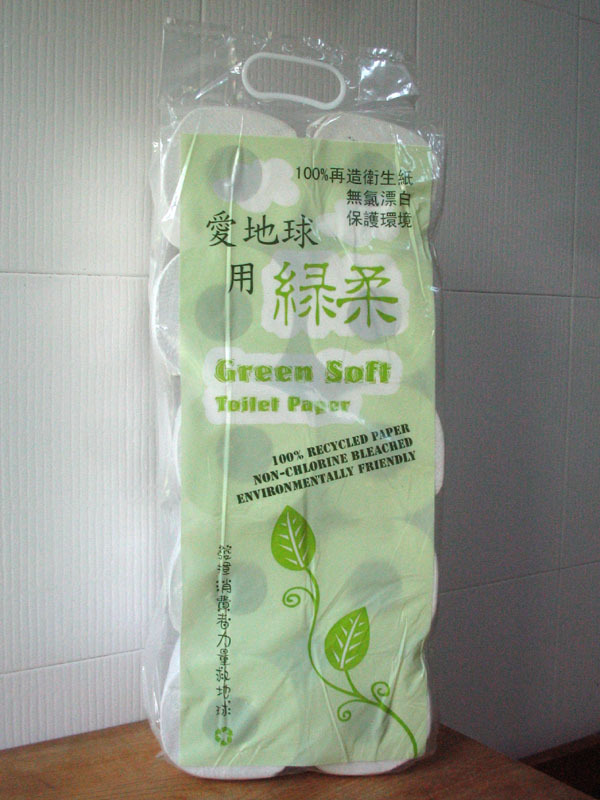 In Hong Kong, that means about 8,500 trees could be saved if each family replaced one roll of toilet paper made from virgin pulp with one made from recycled paper. You may hear the paper industry argue that trees are not cut down to make toilet paper because it is made of sawdust from the lumber industry. The NRDC disagrees however, saying that the market for wood residues is so large that it definitely is part of the business decision to cut down trees. You decide. Previous Previous post: Launch of Go Green Hong Kong!